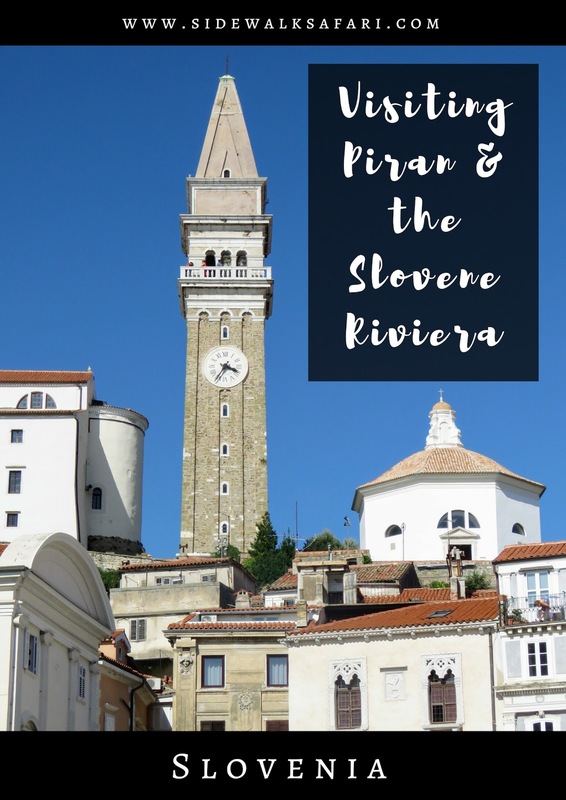 Piran Slovenia and the Slovene Riviera is an ideal destination for a relaxing couple of days. 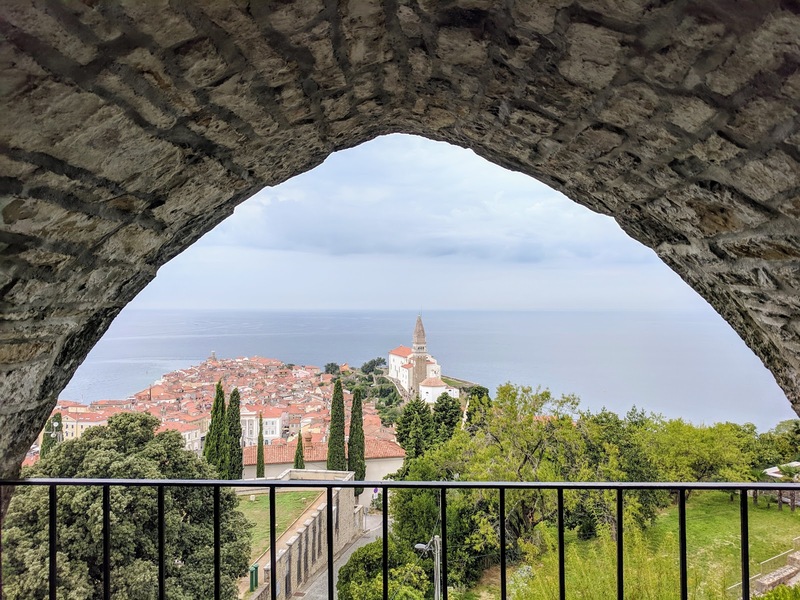 Read on to learn more about fun things to do in Piran and find out how to make the most of a 2 day trip (hint: eat all the fresh seafood). It takes about an hour and a half to get from Trieste Italy to Piran on a daily midday bus service. 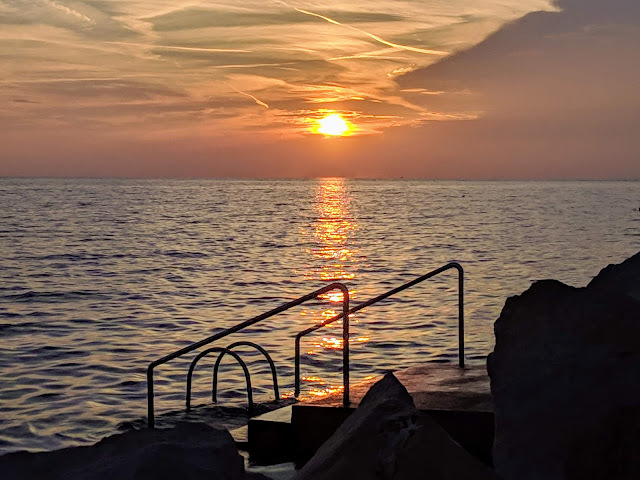 Alternatively, you can take Flixbus to Portorož Slovenia and then connect onward to Piran. We opted for the direct routing for maximum convenience. Start your visit to Piran with a walk from the bus stop around Piran Harbour. On a sunny day, you'll see the pastel buildings reflected in the placid water. Piran is small and super-walkable. Forget Google Maps and let yourself get lost on the hilly streets of the town. If you climb high enough, you'll be rewarded with striking views over the red rooftops. We enjoyed a "self-service" dinner at Fritolin pri Cantini on First of May Square (Maj trg) in Piran. You order at the counter and then they hang up a little fish with your number on it when your order is ready. Dine al fresco on the square. Wash it all down with a glass of wine. Ordering food is self-service but a waiter or waitress will come around to take your drink order. Piran features a number of tiny chapels particularly along the sea. You can't always go inside but you can easily take a peek through the metal gates at the quaint interiors. Piran is situated on the Slovene Riviera on the coast of the Adriatic Sea. Take an afternoon walk in the sun with the sea on one side and bars and restaurants on the other. Continue around the bend until you discover a rock slab with people sunning themselves. Set out your towel and while carefully holding the handrail, make your way down the slick stone steps into the inviting water. Make sure you're a strong swimmer or don't go too far from the steps since the water is pretty deep. Watching the sunset over the Adriatic Sea is a must-do activity in Piran. If there is just enough cloud cover, you may be lucky enough to see the sky light up in an array of oranges and pinks as the sun dips below the horizon. 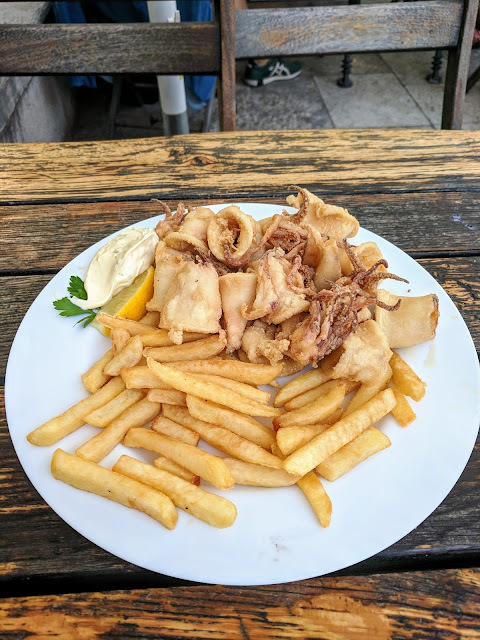 Definitely go hungry to Gostišče "Pirat". 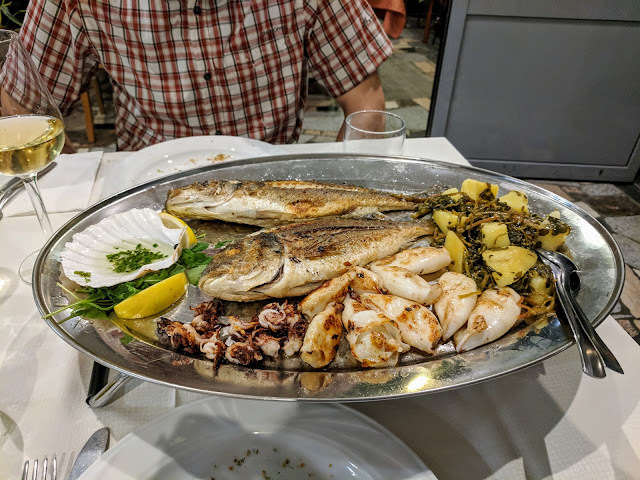 Enjoy a late dinner of grilled seafood in Piran prepared simply and served with local Slovenian Malvazija wine and grilled bread. It was so good that we were tempted to come back a second time. Take the time to climb to Piran Cathedral. Peek inside the ornate interior. The real attraction though is the views over Piran and the sea beyond. For just a euro, you can climb the steps to the Piran Cathedral bell tower. We arrived just as the clock struck 11 am and got to hear the resounding tones of the bells striking the hour. You may want to cover your ears! Aside from the bells, the views from the bell tower are especially nice. Walking around the edge of the bell tower is a little bit of a tight squeeze but worth it for the stunning views. Piran was once a walled city and portions of the city wall still remain. For just 2.00 EUR, you can enter the turnstile and climb an intact section of the wall. Admire the Piran Cathedral and bell tower below. 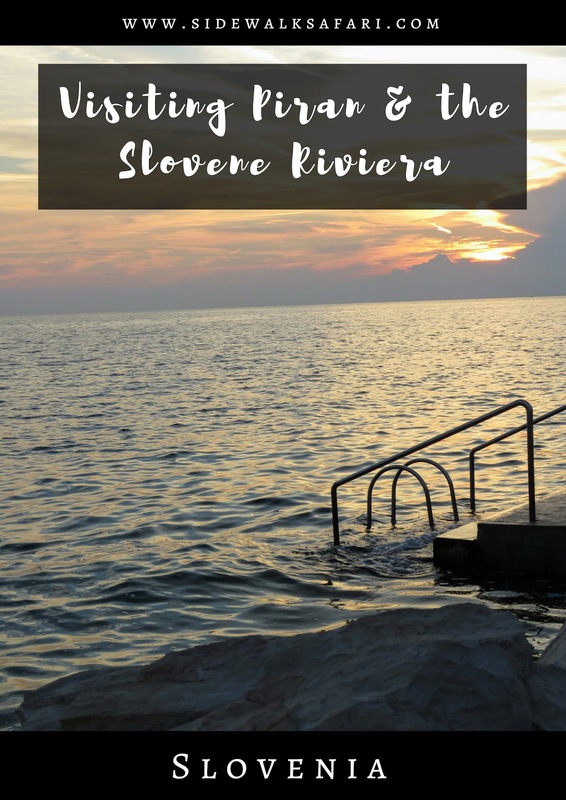 You can climb steps to a few different towers (watch your head due to the low clearance) and take in more amazing views of the Slovene Riviera. Descend back to Tartini Square, the heart of Piran, and have a seat at one of the many cafes lining the square. You've definitely earned a frosty beverage after the long hike up to the cathedral and Piran Town Wall. A Union Radler is an ideal low alcohol beverage that is super-refreshing. 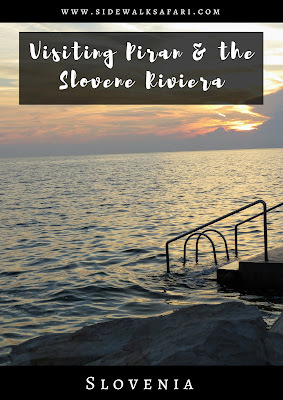 Take the public bus from Piran to Izola to see another side of the Slovene Riviera. Bring along some bread drizzled in salt from Pekarna Rina near the bus stop in Piran as a snack. It takes about 30 minutes to get from Piran to Izola by bus. Upon arrival, take a stroll along the sea. Izola was a pretty sleepy little town in Slovenian Istria. 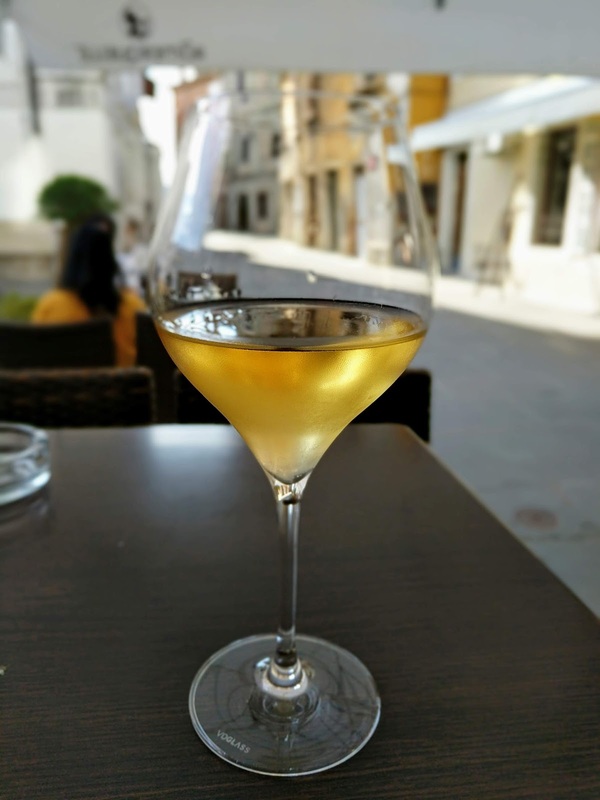 Our favorite stop was Manzioli wine bar for a glass of Slovenian white wine served at outside tables. Izola is at most a half-day diversion from Piran. On our final morning on the Slovene Riviera, we took the public bus from Piran to Portorož to catch our onward Flixbus to Rovinj Croatia. 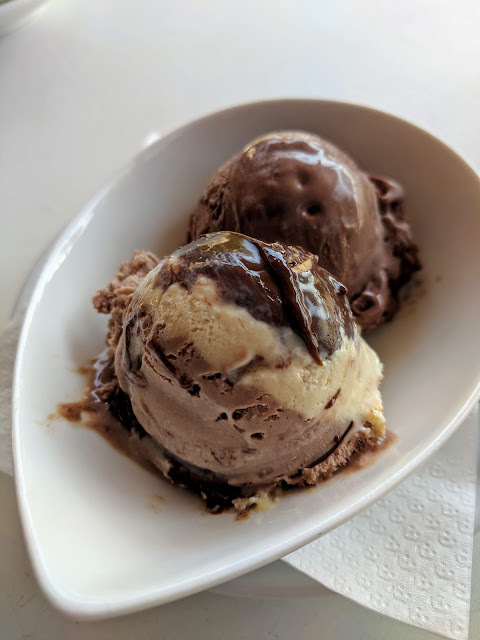 We spent 30 minutes walking along the shore before ducking into Cacao for two scoops of delicious gelato for breakfast. This really emphasized just how sweet it was to spend a couple days tucked away in this quiet corner of Slovenia. Explore Piran Slovenia and other towns on the Slovene Riviera. Find out about things to do in Piran including a walk around the walls of Piran. Understand what to eat and drink in Piran and how to make the most of a 2 day trip.